Investigation officials have stated that the last radar capture of MH370 was a target in the Malacca Strait about 10 NM past waypoint MEKAR on airway N571, recorded at 18:22:12 UTC. Unfortunately, this last capture occurred before MH370 made its final turn to the south. The location and timing of this turn has been the subject of much debate because it has a significant impact on where MH370 crossed the 7th arc, and therefore it is important in defining the underwater search area. If we assume the aircraft was flying level after the log-on at 18:25 UTC, then the BFO data tells us the turn to the south must have occurred no later than 18:40 UTC. However, if we are open to the possibility that MH370 was descending at 18:40 UTC, then the turn to the south might have occurred after 18:40 UTC. 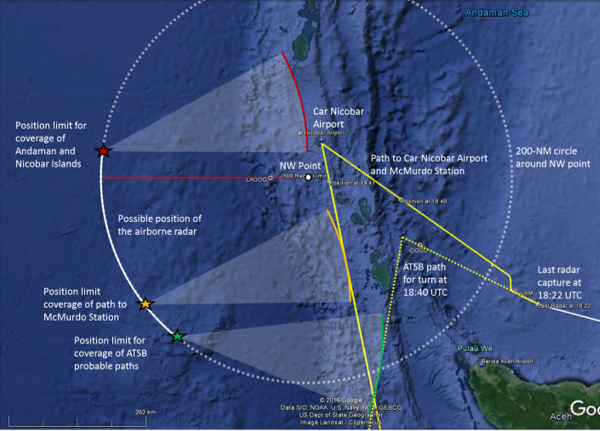 In the ATSB report released on June 26, 2014, we learned that there might have been other radar sources in the area that could give us hints about the path of the plane. There is the statement “The aircraft passed close to a NW point at 1912”. However, the report gives no indication of where that radar source was located, and whether there was a definitive capture. Because any radar captures after 18:22:12 UTC would provide important clues about the final path, there is interest in learning more about this “NW point”. This response provides us with some clues about the radar source. First, we have a precise position for the NW point, which puts it in the Indian Ocean to the west of the Nicobar Islands, and about 15 NM to the right of a plane traveling along airway N571 between waypoints IGOGU and LAGOG. Second, we learn that the radar source is an asset of Singapore. Because Singapore is about 800 NM from the NW point, it is impossible that the radar installation is land-based in Singapore. If not land-based, it is mobile, and possibly airborne. It is well-known that Singapore has significant airborne radar capabilities. 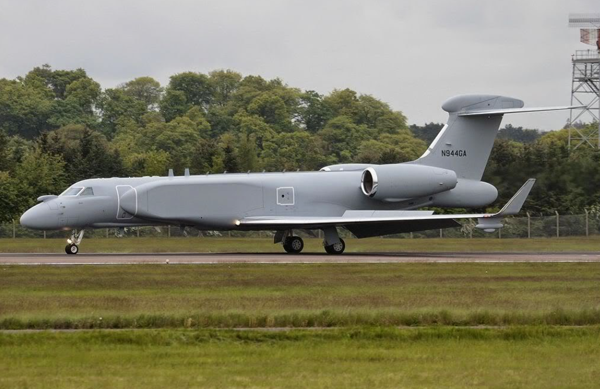 In 2012, Singapore announced that an additional four Airborne Early Warning and Control (AEW&C) aircraft were operational, to complement the first it has fielded in 2009. These G550-EL/W-2085 aircraft were purchased from Israel, and are Gulfstream 550s fitted with phased-array radar. The reported range is 200 NM. I asked the ATSB for more information about the NW point. Because the radar source is a military asset, much of the information is protected. However, I was able to learn that the NW point was shared by a member of the Joint Investigation Team (JIT), which consists of personnel from Malaysia, Australia, China, the UK, the US, and France. The NW point is not an actual radar capture, but was used in early path models as the latest time and position for the turn to the south. Basically, if the turn had occurred to the northwest of this point, it would have been detected by the radar source. I also learned that this radar source had no coverage of the Andaman and Nicobar Islands. Finally, I learned that this radar source had no coverage of any of the high probability paths predicted by the ASTB. There were no radar captures after 18:22:12 UTC. The range of the airborne radar was 200 NM. The NW point is at the limit of the range of the airborne radar. The airborne radar was in a tight holding pattern and never was very far from a fixed location. All of the Andaman and Nicobar Islands were beyond the range of the airborne radar. A path reconstructed with a turn at 18:40 UTC (the latest turn considered by the ATSB) would be beyond the range of the airborne radar. The results from the analysis are shown in the map below. A circle with a radius of 200 NM defines all possible points at the range limits of the radar. Therefore, the position of the airborne radar would be somewhere along this circle. Possible radar positions that satisfy the criteria listed above fall on an arc between the red and green stars. Points to the northeast of the red star would have allowed radar coverage of portions of the Andaman Islands. Point to the southwest of the green point would have allowed radar coverage of some of the high probability paths reconstructed by the ATSB. If the radar source was located at the orange star or to the south, MH370 would have been seen if it followed a path between Car Nicobar and McMurdo Station. However, radar positions along the arc to the north of the orange star would not have seen MH370 if it traveled along this path. It’s therefore possible that if an airborne radar source was circling about a fixed location somewhere along the white arc between the orange and red stars, it would not have seen MH370 if it flew towards McMurdo Station. But here’s a related question: Why was Singapore possibly operating an AEW&C asset in the Indian Ocean to the west of the Andamans and 800 NM from Singapore? This entry was posted on Saturday, February 11th, 2017 at 8:27 am	and is filed under Aviation. You can follow any responses to this entry through the RSS 2.0 feed. Both comments and pings are currently closed. @Brock McEwen: Welcome to this forum and thank you for your comment. My understanding is that the 4600 us offset you reference is not due to processing delay. Rather, it is slot misalignment caused by the change in data rate from 600 bps to 1200 bps between the initial log-on request and the next acknowledgement. It is therefore repeatable and can be precisely measured. Others like Don Thompson are more knowledgeable and should feel free to correct me. Thanks for the reply. “With precision” is the answer I was looking for – or at least, it was my question. Just how precise is precise? +/-1 microsecond? +/-10? +/-50? We must also distinguish between precision used, and precision displayed. It is possible the ATSB has this value to a greater precision than the 4600 microseconds it has published; if so, outside models could be drawing Arc 7 much more inaccurately than would search leaders. If this value is 4600 to the nearest microsecond, the double-zeros are a 1-in-100 fluke. When added to the fact that the nominal BTO at Arc 7 (23,000 on the dot) is supposed to be accurate to the nearest 10 microseconds – a 1-in-100 fluke in its own right – and you have a 1-in-10,000 a priori chance of seeing 5 zeros in those two critical determinants of Arc 7. I keenly await the input of the experts whose input you’ve invited. Thanks for facilitating. On strict reading, your answer does not actually guarantee that the required correction at 00:19 will be known with precision. It is possible for a process to be both repeatable and measured precisely, and yet give wildly disparate and thus unpredictable results each time. The R600 to R1200 BTO bias difference is 4600 usec to an accuracy of ~ +/- 10 usec, determined by averaging many samples each with 20 usec log resolution. This can be confirmed by inspection of the logon data while the plane was stationary on the ramp at 16:00 UTC. The jitter documented by ATSB SWG is actually a larger source of uncertainty in the 7th arc position. It is the main source of the +/- 5.3 NM uncertainty. Victor, If the “200 Nm” constraint is valid, I find it hard to accept the notion that a G550-EL/W-2085, (or any AWACS for that matter) was the “source”, and to my mind, the idea of “a tight holding pattern” even less so. For a start, the “radar range / radar horizon” of any AWACS orbiting at say FL300 is roughly 200 Nm to a “surface target” and nearly 400 Nm to an “airborne target also at FL300”. Your constrains speak to me of a surface PSR, specifically a Singapore NAVAL SHIP Air Search Radar, (such as a Formidable class frigate, or a Victory class corvette) as being a “far more likely source” than the idea of a G550-EL/W-2085 in a tight holding pattern, especially in the arc positions you posit. One must wonder why a G550-EL/W-2085 would be out there in the first place, given transit to and from, it’s “time on station” would be very “limited” out there, and therefore of little use. Perhaps it would be instructive to research any ship position databases for the period, to see if the movements of any Singapore Navy assets can be determined or deduced ? @PeterC: First, radar range is not radar horizon. The EL/W-2085 radar has a reported range of 200 NM. A surface asset such as the Formidable class frigate could have been the radar source. It comes down to what the mission was, which we don’t know. If you have access to the position of military ships in that timeframe, please share. @ALSM: thanks for replying, and for the quantification. I will review the tarmac calc. Does the 4600, in your opinion, do a good job of causing the 18:25 login to mesh with adjacent data points (BTO values immediately after, and the supposedly “known” position at 18:22:12? Those would have been good control checks. I did actually revisit your BTO paper after my original post. Do you have similar tolerance stats for the elements of “K”? I agree 10 microseconds is peanuts – maybe a couple of kms of incremental error bars in arc 7 placement; slightly more at 18:25, where the sat is higher in the sky. 2) even if both the 23000 and the 4600 were rounded to the nearest 20, we’re still looking at a 1-in-125 a priori chance of having all 5 zeros in those two critical inputs (23000, 4600). P.S. Did you ever try running your/Brian’s end of flight model with engine 1 flameout moved up to 15 minutes prior to engine 2? I know the ATSB update gave 15 min only as a boundary value; still, I’d be interested to hear whether your model said the same thing as mine: that a flameout time that early would leave a 777 with insufficient energy to cover the required distance between arcs 6 and 7 in the required time. While I generally agree with your numerical observations, I tend to be more concerned about the lack of any physical interpretation provided for the BTO bias variation between R600 and R1200. We (the collective we) are conditioned to believe that given a set of numbers we can compute and average and a variance. While we can always do that, the average and variance are not guaranteed to be meaningful. In fact, they are meaningful only under very specific restrictive conditions. The DSTG’s computation of an average and variance with respect to the BFO data from previous flights is a case in point. The design of the AES should be characterized well enough that the BTO bias variations (R600 to R1200) and the underlying reasons should be known and should be published. It should not be left to the vagaries of measurement determination. Where is this information, and why is it being withheld? Great that you created this new forum. Currently I’m travelling, so just a short contribution for now. The explanation about the NW point the ATSB provided is rather cryptic and we are at risk of over- or mis-interpreting it. What is puzzling to me is the apparent accuracy of both the location and time connected to the point, which is reinforced by the wording in the appendix of the june 2014 ATSB report saying that the aircraft passed the NW point at 19:12. In addition, it was mentioned as a reason for the (sudden) movement of the search area further north (to the location where the acoustic signals were recorded beginning of April 2014), suggesting that the info about the NW point was rather concrete. On the other hand, the fact that ATSB used a line from IGREX to the NW point for estimation of the performance work suggests that it was not a real radar capture and perhaps not that accurate/concrete. I’m glad you followed up on the info I received and asked further questions. However, still it is far from clear. The most prominent next step would perhaps be to definitely find out if the NW point was indeed based on a radar capture or a “non-capture”. Not sure how to do this, because as you explained we are probably dealing with “shielded” information. A final consideration (and feel free to correct me if it leans too much towards the paranoid): without knowing the original source for the NW point, can we be sure it was not a red herring? Note in this respect that I do trust the sincere efforts of the ATSB, however can we trust all parties that provided info to them? @Niels: Welcome to the forum, Niels. I’m glad you chimed in. The ATSB took issue with my calling this a radar point. The strong implication is that it represents a point beyond the range of a radar source. Unfortunately, if not a true capture, I think that a non-detection by a radar source positioned in the area where I propose does not exclude any of the paths that are on the table. Considering the subject of the blog post and surveillance assets that may have been active west of the Andaman & Nicobar Islands on 7th-8th March 2014. 2/ During February 2014, 6th to 10th: India’s Exercise Milan 2014, was undertaken in the Andaman Islands. The exercise involved vessels from India, Australia, Bangladesh, Cambodia, Indonesia, Kenya, Malaysia, Maldives, Mauritius, Myanmar, New Zealand, the Philippines, Seychelles, Singapore, Sri Lanka, Tanzania and Thailand. To be clear, the focus of the exercise was less of an interest in anti-air operations, more co-operation for littoral protection and humanitarian aid operations. Any or all of these activities could place vessels, and aircraft, in the area of interest in the period of interest. Victor, no, I do not have, nor do I have access to, archived AIS ship movement data, but it must exist somewhere. Re the ELW-2085, I think the 200Nm I saw mentioned on another page refers to “instrumented range”, which I think refers to the “limited battle zone” comments below. When you consider the “extended detection range” remarks, it is pretty clear I think that the “maximum range” is much greater than 200Nm. The ELW-2085’s four sensors are: Radar, IFF, ESM/ELINT and CSM/COMINT. A unique fusion technique continuously cross-correlates data generated by all sensors: this data is combined with an automatically initiated active search by one sensor for specific targets detected by other sensors. A radar with conformal phased array antennas for simultaneous coverage and instantaneous focus on selected targets. The ELW-2085 advanced radar has several conformal phased array antennas. They are mounted on the fuselage of the aircraft and can provide up to full 360 degrees coverage. Surveillance can be limited to the battle zone and other areas of interest. The scan rate in these selected areas is much higher. A special mode for maneuvering and high value targets employs a high scan rate and beam shapes optimized for each target to ensure tracking performance. Verification beams sent at specific, individual, newly detected targets eliminate false alarms. Track initiation is achieved in 2 to 4 seconds. By transmitting extra long dwells in selected sectors, an extended detection range is achieved. The system uses distributed, solid state transmitting and receiving elements. Each element is controlled in phase and amplitude. The system continues its operation even if some of the units are faulty. Furthermore, the videos below indicate far greater “useful range” than 200Nm. I have just seen Don Thompson’s post at February 12, 2017 at 10:08 am concerning Exercise Milan 2014. It would seem that there was a considerable number of Naval surface assets from many country’s in the general area at the time. If we could “nail down” the “exercise area” boundaries (which would have been published in both “notices to mariners” and “notices to airmen”) it may be possible to “exclude” some areas for a possible FMT. Overall, I think that it is highly unlikely that the FMT was as far north west as some people have been postulating lately, otherwise it “would have been seen” by these ship radars. @ radar junkies Has anyone created a composite map of radar coverage from the 8 entities? The holes in the coverage might indicate possible clear flight lanes which might lead to different possible routes. They would also more clearly show who is withholding information. It’s hard to believe no one was watching. If anything I would think the watchers didn’t want to admit they were looking. No one wants to admit they were tracking in the area because it might compromise their military intelligence. Please find below a link to my paper entitled “The probable End Point of MH370”. This paper is based on a model of the Indian Ocean and the analysis of forward drift tracks from the 7th Arc to the locations where floating debris from MH370 has been found. There are some interesting results. I have never heard that waypoint YWKS (Wilkins Field) mentioned, but SkyVector knows where it is. I do not see it in FS9 or PSS777 but obviously could be added via flight planner. Are we still saying VOCX as starting point? If it is VOCX to YWKS, I some lat/long crossings like 58S06. I like that the new path stays away from COCOS direct flyover. I echo Victor’s comment – a substantial body of work deserving of careful consideration. Nicely done. The issue remains, however, that neither drift analytics nor the ISAT data are deterministic. Therein lies the essence of the matter. I think it is fair to say that most thoughtful people are in “North” camp. However, I do not believe that the arguments are strong enough to rekindle the underwater search. I am not sure where the bar is set at the moment relative to “convincing new evidence”. @DennisW: The best we can do at this point is to exhaustively analyze the scraps of data we have and hope that more data, evidence, or insights will surface. There is a possibility that more information becomes available when the next Malaysian report is released early next month, although I don’t think anybody would bet the farm on that outcome. In the meantime, studies like Richard’s help to better understand what we have today. I plan a future post highlighting Richard’s work and what the implications might be. @Bill: Welcome, and thank you for the information. …fyi the suggested path to Wilkins happens to l00k a lot like a new proposal by @Nederland he had published a dropbox type report in the last few days, his path goes around Indonesian radar and then goes BEBIM to NOBEY. Also note the original 1090E to NZPG home simulator path crosses Arc7 close to the same spot, and I’ve been wondering if the strategy could have been to resume that orig simulator path. However, I can see no particular underwater target along the path. In fact, if 30S is correct, MH370 could be on the Gulden Draak Seamount which is a “shallower” area (but I do not know what the terrain looks like). I certainly defer to your expertise and look forward to your analysis. In the meantime, the parties most affected go back to business as usual. The world has largely forgotten MH370. The Malays are under no pressure to do anything. You can be virtually certain that the next Malaysian report will shed no additional light on what happened. It is essentially over. Malaysian Consul-General in Kunming Datuk Siow Chen Pin said this was reflected in the arrival of 1.68 million tourists from China to Malaysia in 2015, which saw an increase of four per cent from that of 2014. Between January and October last year, tourist arrivals from China was 1.75 million, he added. He said the MH370 tragedy did affect tourist arrival from China, but only for some time after the aircraft went missing, and the number soared again after that. @TBill: You have no reason to defer to me. I am guessing just like the rest of us, and I freely admit it. One of the things I’ve observed is that anybody that claims to be certain about any particular scenario is simply showing his or her bias. That said, I think that paths, like Richard’s, that can be related to a final waypoint and match the drift models have a higher probability than those that don’t. @DennisW: Sadly, I agree that Malaysia has shown little interest in pursuing this, and that’s unlikely to change. There are private groups, however, that are talking about raising money to continue the search. It’s questionable whether serious investors at this time can be persuaded that the probability of success is high enough to finance a mission. It’s always possible that new data, evidence, or insights might change that, but as a wise man once told me, “hope” is not a strategy. The seabed scan of the priority search zone was conducted during the 26 months from November, 2014 to December, 2016. As someone dedicated to the pursuit of closure for next of kin, I, too, would like to see drift studies used to generate precise answers to difficult questions. For me, the question most in need of a precise answer is: WHY was the remaining 70% of the search conducted without ever reflecting the emerging indications of these studies? And why was the only study that WAS cited as search decision support (CSIRO’s, whose leeway assumption was literally back-solved to validate the search box) unable to benefit until month 28 from seawater tank experiments on the flaperon apparently performed in Toulouse in month 8 ? It seems that, when this flotation result finally did manage to wash up on CSIRO’s shores, the PSZ-supporting conclusion promptly evaporated. In pursuit of the truth of MH370’s fate, I believe our search strategy is optimized not by using drift data to mark an x on a map, but by forcing search leaders to explain the glaring gaps between what they did, and what the data actually told them to do. Good luck with that. The reality is the data suggested doing nothing, but to wait for debris or other information to shape the course of action. You can recall the early pre-flaperon days as well as I can. Both the SSWG and IG were confidently sticking pins in a map based on totally ambiguous ISAT data coupled with Occam’s Razor and “that is the way pilots like to fly airplanes”. Anyone suggesting a more holistic view of the events was regarded as ignoble. The DSTG did include the flaperon find in their Bayesian analytics. My impression of that exercise was that it moved the non-flaperon heat map imperceptibly. As far as the ATSB and above is concerned they have made it abundantly clear that they were only doing what the experts were telling them to do. The Nuremberg Defense at its finest. That is all you are going to get. @Dennis: on behalf of all of us who wish to hold search leaders properly accountable, I thank you for wishing us luck – and for what I can only surmise to be your staunch support. Lest there be confusion: if both the Lifo Hotel screenshot and the Inmarsat PDF are actually authentic, then the problem is, in my view, specified to within reasonable tolerances. If you fly at cruising speed AND in a straight line – you get the arc spacing observed. And if the 18:40 BFO is given its most reasonable a priori interpretation, the zone searched was the one to search. I have great respect for the IG’s signal data accreditation and acumen, and continue to stand by my support for their original conclusions – but always with the caveat that I have yet to be persuaded that either of these little puffs of digital imagery are in fact trustworthy evidence. The emerging physical evidence has served to intensify my skepticism: drift studies that are NOT constrained to Arc 7 have their likelihoods centred several hundreds of kilometres AWAY from it; studies which begin by assuming an Arc 7 impact to begin with thus select the best of a bad lot. I would be thrilled if a new search positioned slightly northeast found wreckage. But theories putting impact at S30 not only struggle on motive, but do nothing to explain debris-free Oz shorelines, and must resort to decidedly second-tier interpretations of the ISAT data. Many also require us to suspend disbelief regarding the length of time a B777-200ER could fly around – off-course – in the Malacca Strait without any radar ever having detected it. I encourage readers to locate the Malacca Strait on a population density map. In summary: while model(er) error – of the variety you mention, and others – is an acknowledged and persistent risk, I think an equally legitimate response to the gap between sat-indicated and debris-indicated impact point distributions is to call the source data for each into question. By “search leaders”, Dennis, I’m not really talking about the ATSB. I have never really been talking about any front-line agency. I’m talking about the anonymous shadows actually running this farce. Let’s turn out all pockets, and find out which. Such shadows could well turn out to be agents of the Malaysian government – a culprit toward which I have never not been pivoted in online discourse. I for one remain generally more persuaded by Florence de Changy’s conclusion – that Malaysia’s reputation for corruption may have been seized upon by folks in need of scapegoats and smokescreens. Whether or not any or all of the ISAT data was faked, the hard question needs to be faced: what if it is one or more of OUR governments that have foot-dragged on this search for 239 souls? If that question is faced honestly, I am confident that demand for a public audit will one day become overwhelming. @Brock. Your own drift analysis indicates that the “debris” could have come from nearly anywhere in the Indian Ocean but also reaches the conclusion that the “search area” would be highly improbable. Forgive me if I am a little sceptical about the predictive validity (in a deterministic and real-world probability sense) of the Adrift model. As you are well aware, this was designed to illustrate the dispersion of micro-plastics, that are subject to effects of upwelling and mixing in the water column rather than surface drift. I appreciate that you have consulted widely with (and indeed produced a meta-study of) ocean current drift modelling experts. These folks use real-time estimates of ocean surface current at high spatial and temporal resolution, professional modelling techniques as well as uncertainty intervals on the leeway/stokes drift factors applicable to diverse debris types. What makes me rather suspicious is the “certainty” of the conclusion that it must have come from area A rather than B. As any professional drift modeller will tell you, the uncertainty limits (modelled point origin) in this part of the world are already out to >100NM x 100NM after as little as three weeks’ drift. This is particularly true of the eddy-infested borderline zone between SIO gyre and circumpolar current. You wouldn’t ask a skilled amateur to attempt a recreation of long-term (>1 year) weather-forecasting or climate models, would you? I’m afraid that I regard non-specialist models of OSC drift in very much the same vein. After all, they are virtually analogous in the extent to which you can model them at even modest spatial & temporal resolution. I, for one, am utterly unconvinced that amateur drift models (with due respect to Dr Godfrey’s and others’ efforts) can be anything like as informative on probable origin as they purport to be. What interpretation of the BFO at 18:40 is most probable is debatable. As we know, the BFO depends on the speed, track (actually the horizontal velocity component along the N-S axis), and vertical speed. It is a weaker function of position. We have the BFO at 18:28 which suggests a ground speed of around 495 kt along a track of 296 deg and no vertical speed. We also have the BFO at 19:41 which suggests a ground speed of around 495 kt along a track of around 180 deg and no vertical speed. Between 18:28 and 18:40, the BFO changed from 143 Hz to 88 Hz, so at least one of the three parameters (speed, track, vertical speed) changed. Why is it more likely that there was a turn in the 12-minute interval between 18:28 and 18:40 as opposed to an ongoing descent at 18:40? I have heard the argument that the descent would have been exactly timed to coincide with the BFO at 18:40. However, this is false logic because the descent, depending on the rate of descent and the total change in altitude, could have occurred over a period of 10 minutes or more. The timing of a hypothetical descent is no more peculiar than the timing of a hypothetical turn that would have occurred in about the same time interval. I agree 100% with your basic conclusion: that drift studies cannot hope to place hard and narrow limits on a search box. It is with that precise sentiment my Dec/’15 drift study’s conclusion section begins. But when even those wide probability distributions and the search zone fail even to INTERSECT – and the flaperon-only* studies I analyzed DID fail to intersect, absent wind-aiding – then Houston, we have a problem. It is with that precise sentiment my drift study’s conclusion section ends. If you reject that, then you and I will have to agree to disagree. * the “Roy” piece shifts the drift-indicated probability distribution yet further counter-clockwise around the IO, which further counter-indicates the priority search zone, and adds an exclamation point to my original paper’s conclusion. The reason I’m NOT beating you over the head with this statement is because it is scientific both to change one’s mind AND to see the world in shades of grey, rather than in black and white. I continue to credit you on both fronts. I also credit you for publishing opinions which challenge establishment thinking. Often. – a turn in progress, as you say; but also…. If the “18:40 BFO suggests swift FMT” logic is as fuzzy as you now assert, do I take it that you were a dissenting opinion within the group on this point? Why did the IG not at least recommend the ATSB search a wider segment of Arc 7 than it did – something the search ships could have done quite efficiently on their way to and from the box actually searched? I said during the first search that we have no idea what probabilities to assign to our assumptions. I continue to say this about other assumptions that are currently proposed by some, including me. The previous assumption of level flight at 18:40 has tremendous implications on the size and location of the search zone, and deserves to be revisited. The assumption that the flight continued without a loiter is another assumption that needs to be re-examined. I don’t know what you mean about a turn in progress at 18:40. That’s not why I meant to imply. In my previous comment, I was referring to a turn initiated and completed sometime between 18:28 and 18:40, not a turn lasting 12 minutes. Yes, of course. Few people have been more critical of the official search than I have been. On the efforts of the IG and SSWG, I have no issues with them whatever. The IG in particular has been a beacon in all respects. If you had to start a search, the area recommended was the best estimate at the time. No doubt about that. My feeling is that the analytical community will end up being the scape goat for the failure. I have seen this movie more than a few times over the course of my career. It would be highly unusual to see bloody suits after the bus passes. Having said that, our energy is best spent doing exactly what people are doing. Refining, as Victor also said, the information we have. What else is there to do? @Victor: thanks for clarifying – I withdraw my rejection of an assertion which, upon rereading, you clearly did not make. My addled brain misplaced the ‘ongoing…at 18:40’. Apologies. But perhaps I must clarify something for you in return. By ‘a priori’, I meant BEFORE the seabed was ever towfish scanned. If you are now using the ‘descent’ interpretation, I think you must either admit that it was a second-tier interpretation back in 2014 (the only point I was ever trying to make about it), or explain why so plausible an interpretation was ignored, when it would have gutted the IG paper’s conclusion. Recall the ATSB was at the time bathy surveying the very zone the ‘descent’ interpretation leads to, and the IG paper essentially said: “get out of there, and go south”. It is one thing to say “now that we know Plan A failed, we must revisit ”. That is just plain good science. It is quite another to say that ‘descent’ was a nearly-as-plausible interpretation of the 18:40 BFO circa 2014. That is just plain bizarre – it suggests the IG recommended leaving an already-surveyed zone it knew to be nearly as plausible. Not that the burden rests with me to demonstrate, but since you asked: the BFO and BTO values SUBSEQUENT to 18:40 tend to suggest the required change was to direction, and not to altitude, because the BFO values clearly point southward, and the BTO spacings clearly indicate constant cruising speed (which in turn suggests constant cruising altitude). This in and of itself tends to counter-indicate a change in altitude as the 18:40 BFO driver. I concede extra turns, looping, descents, etc. have always deserved – and received – careful consideration by all analysts worth their salt. But, by trying hard in 2014 to convince us all that the sat data said ‘south by 18:40’, the IG seemed to – and damn well better – have had very good reasons for pushing these all to the back seat. Regardless, my quest – to revisit source data, in light of emerging reality – is as strongly scientific as your quest to revisit assumptions, in light of emerging reality. These two lines of inquiry in fact complement each other. But I don’t think we’ve ever disagreed on that. My own analytics, which I tend to trust much more than others (surprise surprise) can make no conclusions about what happened before 19:40. There is no doubt the aircraft was heading South at 19:40. What happened between 18:25 and 19:40 is pure speculation. Yes, I acknowledge that in the fall of 2014, a descent at 18:40 was a “second-tier” interpretation. The failure of the search elevates it’s probability. More complicated scenarios involving descents, loiters, etc. are now more likely. That’s why I advocate reassessing assumptions. Saw that, thx. I made some initial comments on the paper on the JW blog where I first became aware of it. Cut and pasted below. Hey, thanks for the link to the Holland paper. Obviously, it will take a couple of careful reads to digest it properly. My first pass reaction is similar to the reaction I had to the “Bayesian Methods…” book that preceded it. References below refer to the paper. When you create a graphic such as figure 2 – “Histogram of BFO Errors…” you are stepping onto a slippery slope. You are subconsciously (perhaps even consciously) making the assumption that the ensemble mean and variance (from the data collected from the 20 previous flights) would yield the same statistics as if you were to collect the same data from a single flight 20 times as long. Without stating it as such, Holland makes the implied assumption that the oscillator behavior is stationary and ergodic. Stationary in this context means that the mean and variance do not change over time. A process is said to be ergodic if its statistical properties can be deduced from a single, sufficiently long, random sample of the process. The reasoning is that any collection of random samples from a process must represent the average statistical properties of the entire process. Unfortunately oscillators do not behave in this manner. If an oscillator is turned on and drifts off 5Hz over some time interval, it does not imply that the oscillator is more likely to drift back to zero than it is to keep drifting in the same direction that produced the 5Hz error. Figure 5.4 of the “Bayesian Methods…” book is a good example of the behavior I am referring to taken from a previous flight of the accident aircraft. A link to Figure 5.4 is provided below. It is clear that the data in Figure 5.4 does not have a zero mean nor does it appear likely that the data will regress to a zero mean if the flight were to continue. I made no attempt to estimate the true mean and variance of the data points in Figure 5.4. It would have been very helpful if Holland included the raw data from the 20 previous flights as an appendix to his paper. My guess is that the 20 previous flights would look very much like the flight shown in figure 5.4 with smaller excursions on both sides of zero error (the ensemble mean in Holland’s figure 2 is near zero). What is this data telling us? In my view it is telling us that the plane sure enough flew South, but the ground track angle is not reliably deducible from the BFO values. I was a bit disappointed that Holland did not spend more time on the 18:25 reboot. The curious thing, if we believe the ground speed derived using the cell phone connect and the radar data (the radar data also providing a good estimate of location and ground track at 18:25) is why the BFO is virtually error free. If power had been removed from the AES oscillator prior to this reboot, one would expect a significant residual error. Luck perhaps? Certainly not impossible, but I am suspicious. Re: 1840, we have talked a whole lot about Malaysian and Thailand radar, but I hear nothing about Sabang radar. Why did IG/ASTB think the pilot would just loop an big FMT right in front of Sabang radar at 1840 without being seen? RGodfrey does not say why? the descent might have happened at 1840. I would say the reason could be to drop out of the Sabang radar capture, at least temporarily. The VOCX to Wilkins flight path is still only maybe 125 nM from Sabang, but I suppose if the radar operator saw a southbound blip an hour later, he would not associate with the same aircraft. Comments here are closed. Please continue the discussion by commenting on the new post.